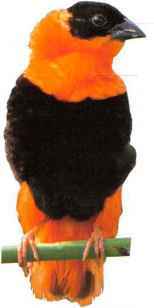 I his colorful weaver is found in tall grass and reeds in relatively moist areas of savanna. A breeding male may mate with several females, as the species is polygamous. The male displays his black-and-scarlet plumage either from a perch or in slow, jerky, bouncing flight across the reedbeds. I lis display behavior includes fluffing out his body and head plumage and rapidly-beating his wings. This eye-catching performance is accompanied by twittering or wheezy calls, uttered both from a perch or during the display flight. Outside the breeding season, birds form large flocks. W hen feeding. Red Bishops walk in short, deliberate steps while foraging on the ground for seeds, grains, and insects. • NEST An upright, oval nest, woven out of fine grass and reed leaves, with a porched side entrance, attached to a reed stem some 3-6 ft (1-2 m) above water. • Distribution Sub-Saharan Africa, from Kenya and Angola to South Africa. I his w idowbird of tropical and subtropical grassland is identified by the red neck band on the breeding male's otherwise black plumage. 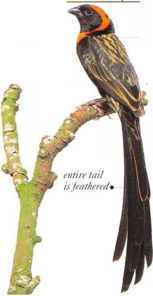 In his territorial display flight, the male flutters around in the air over his nesting territory with slow wingbeats, trailing his long, black tail. The female is duller and lacks the long tail, as do immatures. Males outside the breeding season resemble the females and lack the long tail. The species is gregarious at all times, moving about in flocks and visiting bushes and tall grass, often near water. Birds also roost in large flocks, often in tall elephant grass, again close to water. The diet consists of insects and seeds. • NEST An oval nest, made of living grass and lined with dry grass, with an entrance near the top in the form of a covered porch. 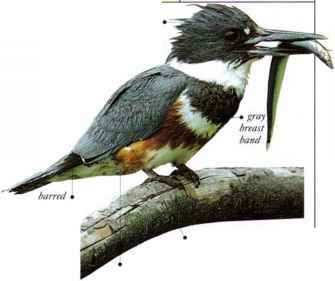 The nest is placed in a bush or reedbed. • DJSTKIBI 'TION Scattered areas throughout Africa south of the Sahara, except in dense forest or desert areas. I his is a common and lively species, living in open, tropical grassland at high altitude. During the breeding season, it is easy to see. since the male performs a wild display dance around his own selected tuft of grass, leaping high into the air and arching his long tail over his back, flocks gather in the post-breeding period and visit farmland, where they feed on seeds and insects, either on the ground or in high grass. • NKST A flimsy nest made of grass and lined with secdheads, with a side entrance. It is placed low in a tuft of grass, with growing blades woven into the structure. • DlSTRIBl 'TION l-'rom SAY. Kenya to N. Tanzania. 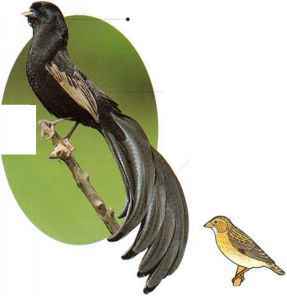 • REMARK The male's long tail accounts for the 8 in (20 cm) length difference between the sexes.